Nice route. It sure needs some terrain paint as well. No? Otherwise, it sure looks fun. Okay, glad you were able to get around the issue. Okay then. It will take a few days for them to get back to you, but until then, probably best not to touch the asset in question so that you can use the advice given. Have you tried a database repair? What problems are you having in surveyor? Do you think you could do a few more changes to make a 1950's themed version of the layout, alongside removing the catenaries? Will one of keimei's JNR steamers pull the Christmas train on the 3ft version of the route? 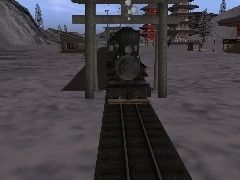 Hello I'm WebbK, I recently completed the 30'' gauge Rt, Winter in Japan (Fictional). Now I'm currently thinking what my next Rt will be. If you have an Idea, put it in visitor message. Note* I prefer small routes as I can, because my PC is old, and my new PC is a pain to use. You can request it in my discussion tab in my youtube channel, Kevin Webb.